Get a preview listen to the tracks from Reginald's Revenge at Amazon.com! 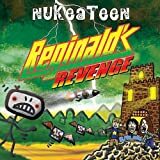 Nukeateens 2nd album Reginalds Revenge will be out on 26th July 2010 for download and on CD during August. Nukeateen are a 90s grunge band.